In Dead Reckoning, Kate McQuillen repeatedly uses acts of destruction to generate new images. 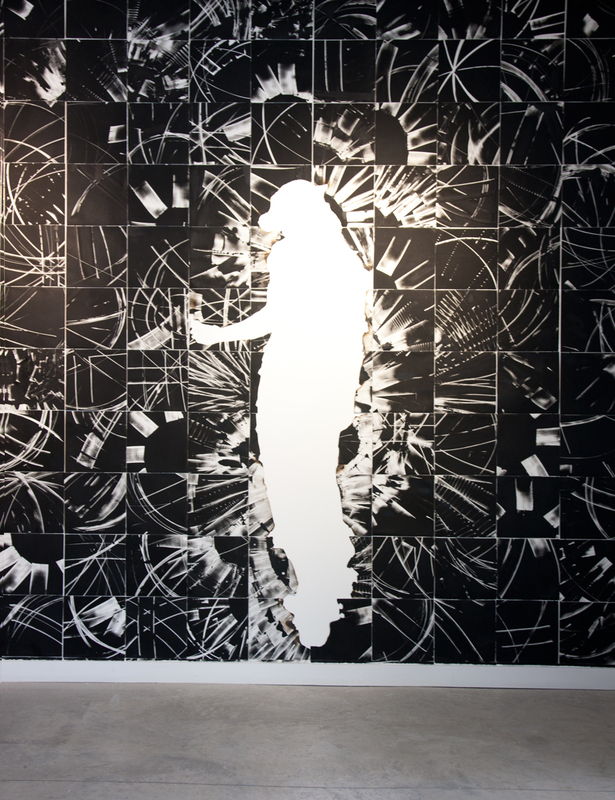 Razor blades become drawing tools and fire burns shapes into her works on paper. 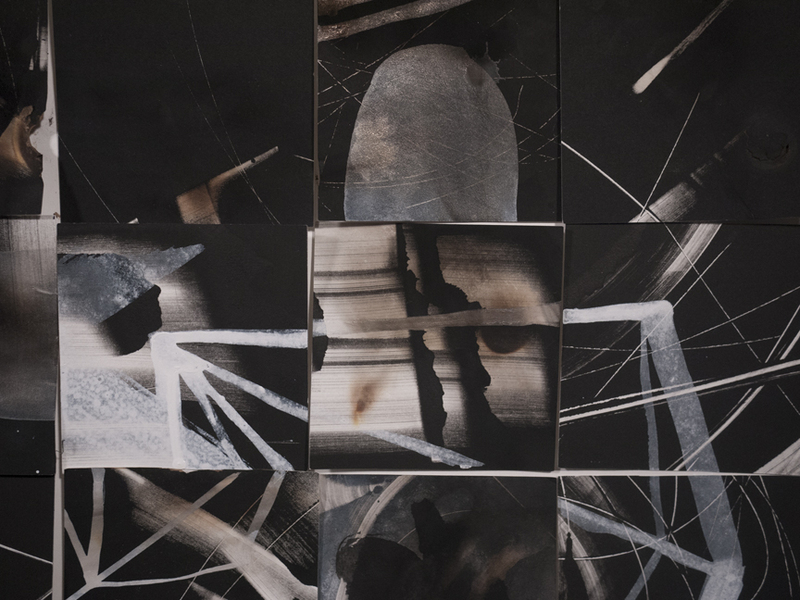 The artist cuts up finished monoprints and, through the process of recombining the particulate remainders, creates a web of composite information. The resultant mélange is now a scramble of disassociated parts, the fragmented picture plane denying any comprehensive resolution or reading. 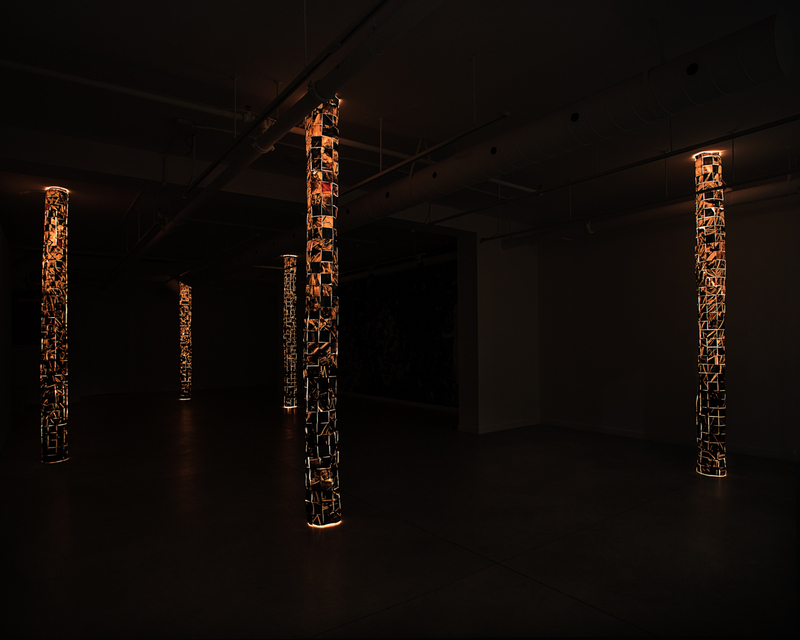 These assemblages take two forms—a large wall piece composed of the described monoprinted segments and five tall, sentry-like pillars penetrating the gallery's space. Navigating these columnar structures is supremely physical, demanding orientation akin to the digital universe we have come not only to occupy, but also to abet. A remote relationship is struck between our singular physical bodies and our plural digital identities. The self and all of its attendant intangible parts have become ubiquitous, a paradoxically absent presence manifested by the voided silhouette extracted from the mural covering one entire wall. The artist manages to impose this dislocation on even those who don't enter the gallery as a visible glow penetrates the building's glass façade, maintaining separation while still completely embroiled in its urban surroundings. The exhibition title is here, ironically, something of a foil—meant to describe a mechanism through which a person's location is tracked, Dead Reckoning only beckons at the potential information encapsulated by its structures. The thread sewn through this current installation is taut, tugging between the stasis of sophisticated technological mechanisms and the rapid circulation of data. In the final week of the exhibition, a large wall piece composed of the described monoprinted squares will be slowly cut away from the wall in segments, ultimately destroying what was once a unified image. 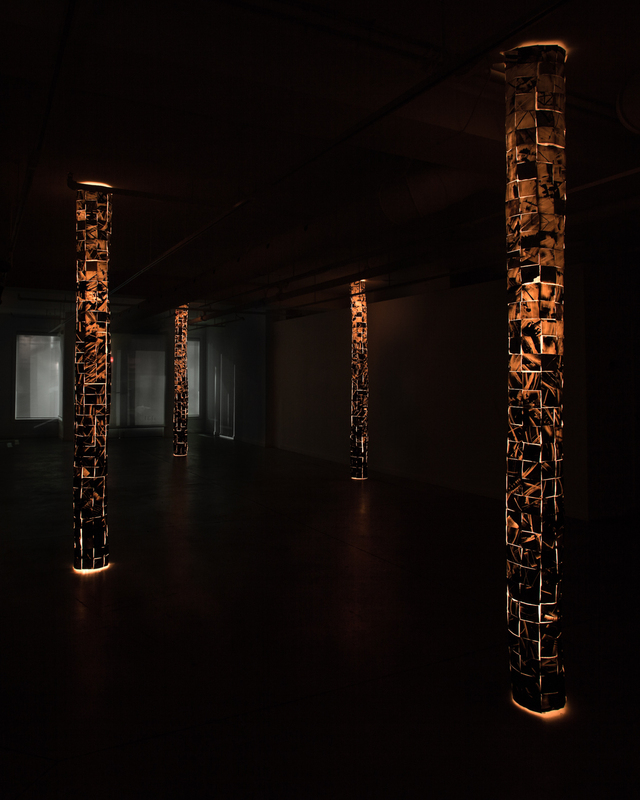 By dispersing these portions to other locations, McQuillen furthers the gesture of scrambling her information and harnesses her affinity for the act of destroying as a means to start anew. KATE McQUILLEN (b. 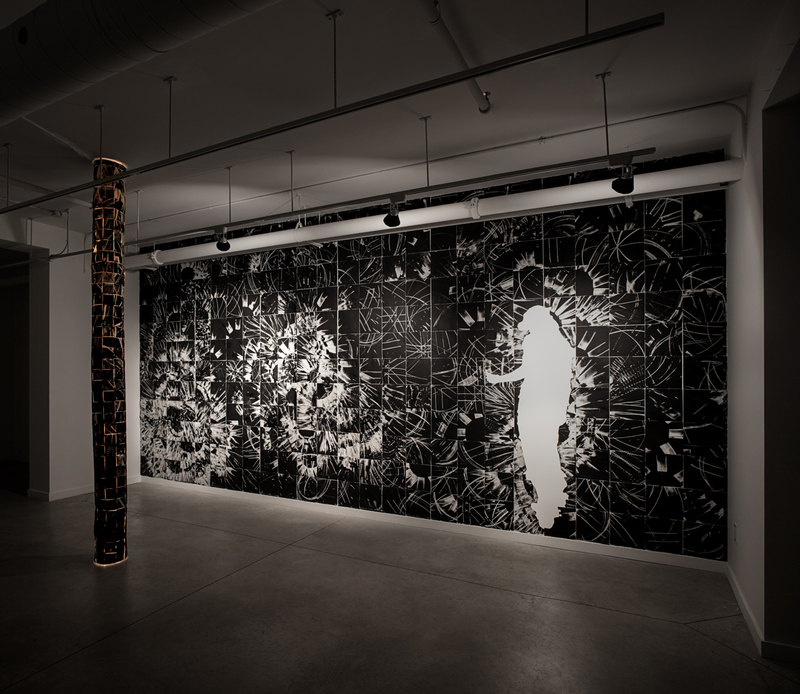 1979, USA) is a Chicago-based artist working in printmaking, installation, and sculpture. 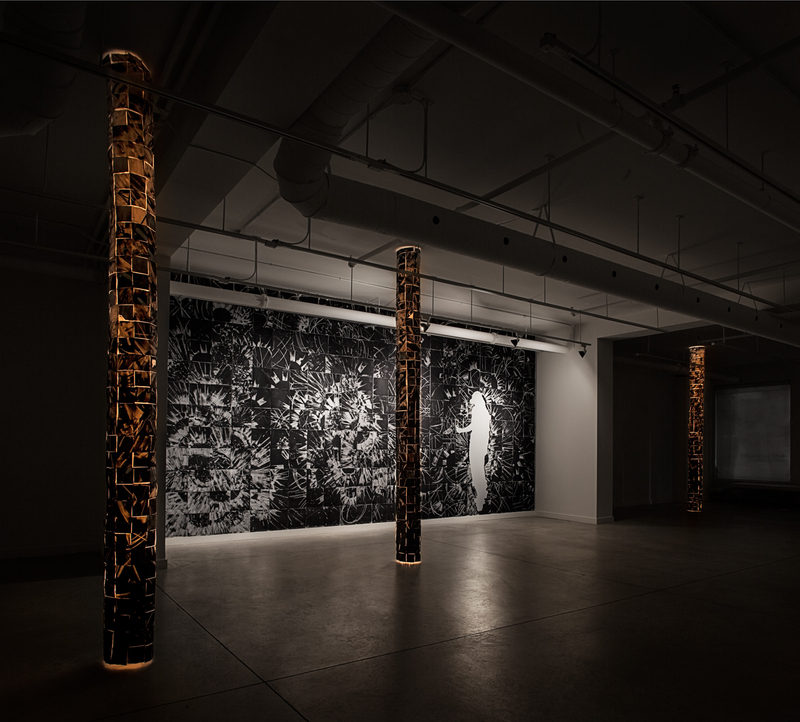 She has shown in Toronto, Chicago, Montreal, and Boston, and has works in public and private collections in Europe and North America. A number of her projects have been funded by grants from the City of Chicago and the Illinois Arts Council. In addition to exhibiting publicly, the artist has ambitiously pursued numerous residencies, in the U.S. and abroad, including: Ox-Bow School of Art (Michigan); Elsewhere Collaborative (North Carolina); Ragdale Foundation (Illinois); Anchor Graphics (Illinois); Open Studio Printmaking Center (Toronto); Frans Masereel Center (Belgium); and the Columbia College Center for Books & Paper Arts (Chicago). Writings about her work have appeared in such news outlets as The Chicago Reader, Time Out Chicago, Rabble.ca, and Printeresting as well as in publications by the Poetry Foundation, Columbia College Chicago and Rutgers University. 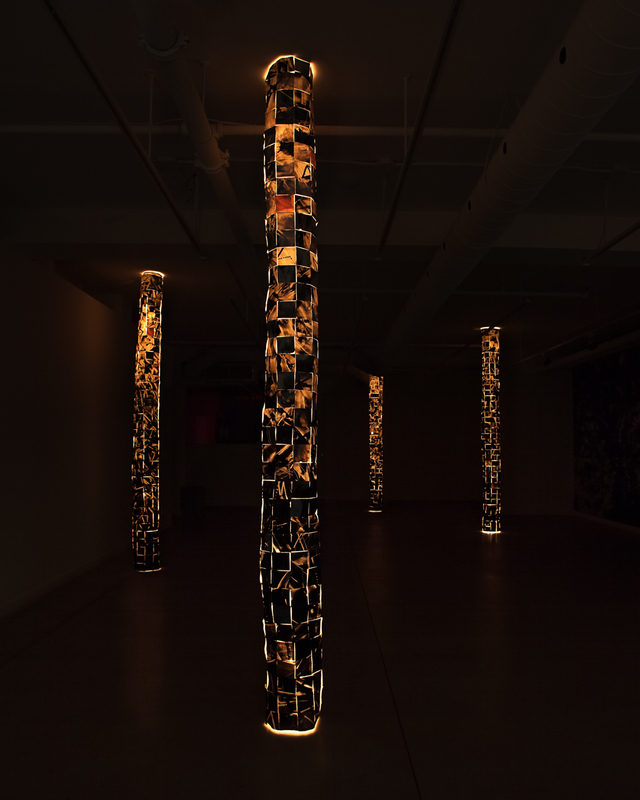 Within McQuillen's artistic practice, she consciously subverts the collectively perceived meaning of commonly encountered materials to bring about new understandings. She enacts a rebuttal of sorts–a repurposing of certain objects that reverses their connotative force. Her inclination towards creation through destruction permeates her use of collage, portraiture, and landscape as she explores perceptions of war, life, and death particular to the American identity.